Quick Hash at version 2.6.9.2- the x32 and x64 versions are packed in a single archive. Settings are saved in XML file inside program folder. 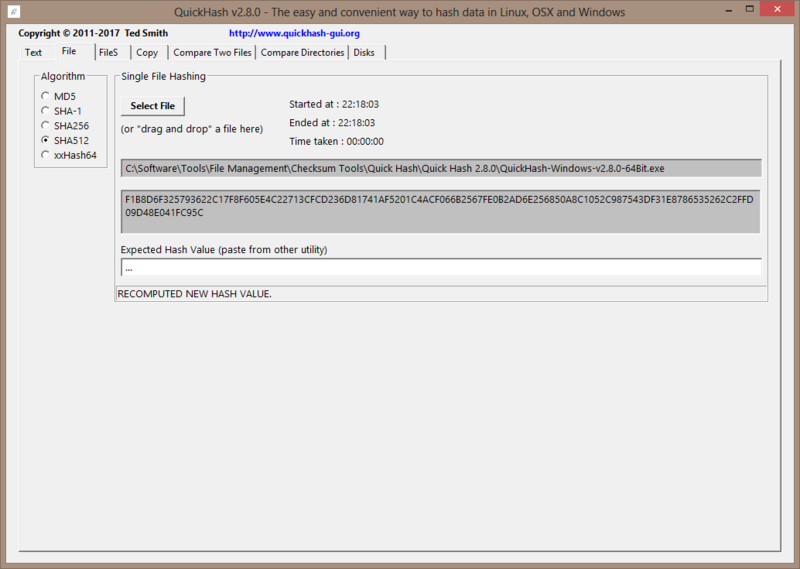 Since version 2.8.0 Quick Hash is renamed to QuickHash. Now QuickHash is at version 2.8.1. Added a “Donate Now” label to the main interface, to try and encourage users to make small donations that can, in turn, help with the hosting costs of the website at AWS. I do not like glary donation buttons & links plastered upon programs' main interface so this new donation link didn't encourage me to donate but to dump the program. I suppose that the developer is not a GUI specialist and it is not easy for him to create "About"/"Help" menu with website and donation links. I might not be that demanding of the GUI if after restart the program was able to remember the last used hashing algorithm or if it had an option to specify the preferred one but this is not the case so upon restart I have to click time and again in every tab to select the algorithm I need, for me this is irksome and unhandy. There's now a payware signed version of QuickHash v3.0.2 (check https://quickhash-gui.org/downloads/). Last edited by Midas on Wed Jun 20, 2018 5:54 am, edited 1 time in total. Reason: Corrected a previous erroneous statement. Is there anything incorrect in my previous statement? Yes. Scroll down the page and the exact same version is available for free. It's just not digitally signed. The second section is "Free Non-Code Signed Downloads" and has both the Mac and Windows 3.0.2 installers, the same ones at the top that are £1.99, available for free. Along with Debian and Linux (pre-compiled) packages. So, you can get 3.0.2 signed or not. Same app same version. You just have the option, as a user, to pay for a digitally signed version of the app if you want to. Why not state it straightly, then? Your second post does a much better job explaining this, IMHO. After further testing, impressive functionality, extensive documentation, native portability, but... fugly UI.